As Latin American countries have emerged from political conflicts, politicians and citizens have realized that consensus and dialogue are both requisites for democracy and a reflection of democratic practice. While no two situations are alike, the solutions are often similar, and much can be learned from each experience. 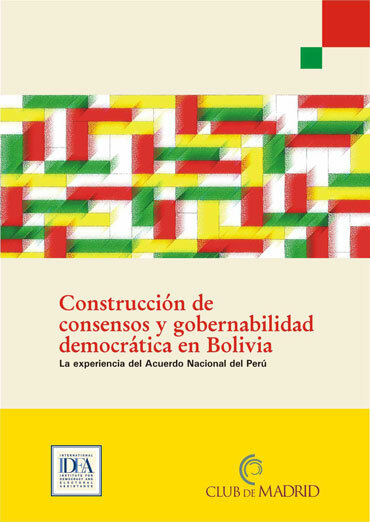 In this publication, five participants in Peru’s National Accord, which began amid the political crisis of 2000, discuss the lessons from that process that are relevant to Bolivia’s political reform. During a mission to Bolivia in September 2005, three months before the elections that would put President Evo Morales in office, the Peruvian National Accord participants discussed their experience with Bolivian political and civic leaders as a contribution to Bolivia’s efforts to strengthen democratic institutions and develop a socio-political pact for representative, inclusive and sustainable governance. This volume contains their presentations and the responses of Bolivian leaders who participated in round-table discussions in four major Bolivian cities, La Paz, El Alto, Cochabamba and Santa Cruz. Members of Peruanos por el Kambio gathered with International IDEA's team and experts. Photo credit: International IDEA.